Slashed meters and broken meter tops liter the normally beautiful Orchard Street in Over-the-Rhine, and many other streets throughout the historic neighborhood. The epidemic of destroyed or stolen parking meters is plaguing this beautifully dense city neighborhood where on-street parking is an ever-increasing concern for new residents. Residents began to notice the meters being vandalized in November 2012 when the city initially announced its intentions to lease its parking system to a private entity. The city insists that the vandalism and parking privatization is not connected. However, UrbanCincy’s investigative sleuthing has found that although the meters are not connected to city sabotage, they are instead connected to a lone vigilante who wants nothing more than to park…for free! Cincinnati has its very own Cool Hand Luke! “You shouldn’t have to pay to park,” exclaimed the culprit from a shadowy street corner. The vigilante who goes by the name Free Space Man, agreed to speak to UrbanCincy only after we agreed to pay for his two-hour metered spot on Liberty Street so that he would not harm the meter. The vigilante described his day-to-day activities, meticulously choosing the meters to be vandalized and deciding on the best time of day to strike. He says he travels the country, setting out to rid the world of working parking meters so he can park his 2007 Range Rover at metered spots for free. He came to Cincinnati when he heard about the parking privatization. “I didn’t even know you had meters and now the city is selling them off. Parking should be free…why do they even charge? That’s the real crime,” Free Space Man said as he sliced off another parking meter at the corner of Elm and Green Street. Attempts at trying to inform the vigilante on the revenues parking brings in to the city and how it allows businesses to turnover spots for patrons seemed to fall on deaf ears with this eccentric individual. The vandal disclosed that his most brazen act of social defiance was in San Francisco, where leaders there attempted to install smart parking meter technology. 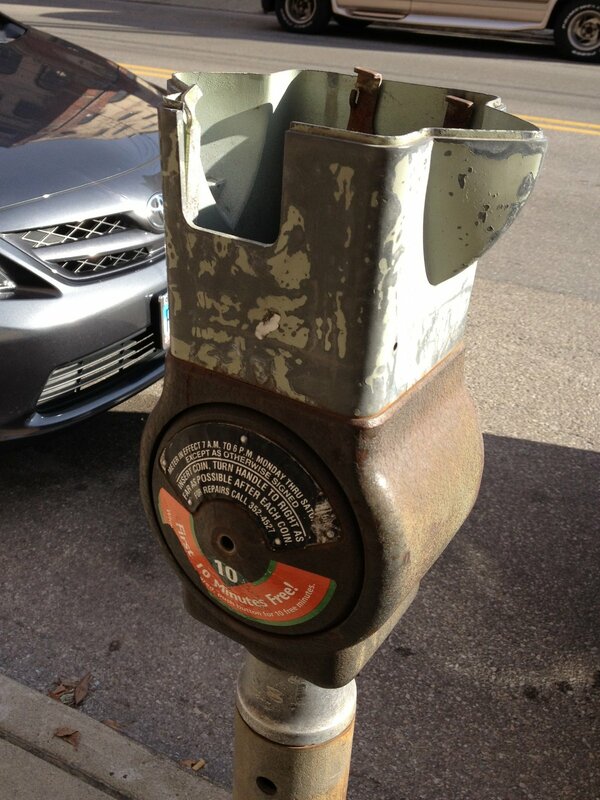 One day, shortly after the new meters installation, a parking meter head was found at the foot of the mayors’ bed with coins still rolling out from its receptacle. Officials who have dealt with the villain have described him as squirrely and demented, and warn that the only defense measure is to throw copies of Donald Shoup’s 763-page book, The High Cost of Free Parking, at the bandit until he finally flees to another town, hopefully never to return.